A great family Advent or Christmas project is decorating the Christ Candle, which will be used at Christmas Eve and during the Christmas season. There are various ways to make a Christ candle. It is a German custom to decorate a large candle with a Chi Rho or other symbol of Christ, place it in a holder, and cover it with a blue silk mantle symbolic of Our Lady, who carried the little Christ under her heart before He was born. Lighted Christmas Eve at midnight the flame is a symbol of Christ, the Light of the World. We have made our own kind of Christ candle in order to teach the children that the reason for Christmas was the Pall and to help them see the thousands of years the Jews awaited the Messias as the prologue to the Redemption. They must understand this, or there is no good excuse for Christmas. He did not come down to be born a baby just because it seemed like a lovely idea. After rereading the story of original sin in Genesis in the Old Testament, we plan figures for our candle which will help us travel in our minds the long corridor leading from the Garden of Eden to Bethlehem. 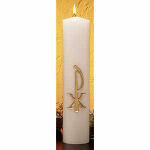 We use a liturgical candle (at least 51% beeswax) about two feet long which can be purchased in most religious goods shops currently for around eighty-five cents. If not, ask the Sister sacristan at the convent if she keeps them on hand for High Mass; if she does, she will be glad to sell you one. After planning where the designs (These designs may be drawn on paper with a soft lead pencil. Reverse them, pencil-side down, against candle, and transfer by rubbing on back of design.) will be placed on the candle, we apply one coat of white shellac to the side of the candle where they will appear. This helps the oil paint to "take." White shellac can be bought at the Five-and-Ten, as can a cheap watercolor or sash brush for applying it. Clean shellac from brushes with rubbing alcohol. For painting the designs we use a small pointed brush of good quality, oil paints, a little turpentine for thinning, and a cloth with turpentine for wiping off mistakes (but don't be too fussy — they rarely look like mistakes to anyone but you). After the paint is dry, we shellac the designs again as protection against too much handling. One does not have to be a fine artist to decorate a candle. Even clumsy attempts when finished are beautiful, and the effect of the whole is rich and colorful. More important than technique is love and enthusiasm. Remember that it is not just the handwork but the reading and thinking and conversations that go with it that make the completed work valuable. As for the figures, if you can't draw them "out of your head" you will find many small figures to trace — in this instance tracing is allowed (rarely otherwise!). Keep them simple, not bothering with fingers, toes, complicated features: stress the action boldly so that they tell their story. Paint in bold bright colors without fussing: this helps to give the final work crispness if the figures are outlined in dark brown — a sienna or umber. Simple patterns of dots, stripes, little crosses, bands of decoration add interest and contrast to the garments. The choice of figures and stories is optional. At the top we have the tree, bright green with red apples, brown trunk, yellow serpent coiling into the tree to recall the reason the Redeemer had to come. Reading in Genesis, we find that God the Father makes the first prophecy of the Messias immediately after the Fall. In it He points to Bethlehem — to Christmas — because the Woman and her Seed He promises are going to be Mary and her Son. Next, we have Adam and Eve dressed in animal skins, weeping with their faces in their hands, and drawn in profile because it is easier to depict the action this way. They understand clearly what they have done: disobeyed God, wrought a debt they can never pay, brought sin and death into the world, destroyed the harmony of the universe. Worst of all, they have lost that divine life they shared so intimately with God: sanctifying grace. Jesus was born on Christmas to repay man's debt to His Father, to open the gates of Heaven, to defeat death by purchasing for us eternal life, and to institute a means by which we might share God's life again, as Adam did. While we live here in our exile from Heaven, the object of His birth in the stable in Bethlehem is our oneness of life with Him in His Mystical Body, the Church, and through it the unbelievable intimacy of our soul's life with the indwelling Father, Son, and Holy Spirit. Thus did Christ restore what Adam lost. Well might Adam weep, at the top of our candle. Original sin was a terrible thing. Next, we have Noe's ark with the dove and the olive branch on top. Bright yellow ark, with an orange roof, white dove, and bright green olive branch, it is very gay. This tells us that Noe is a type of Christ. God sent the Deluge to destroy all the wicked on earth, but preserved Noe because he was holy, and through him the human race is born again; just as through Christ, who from the cross poured forth grace into His Church, and through His sacraments we are born again to divine life. Noe, sheltering in the ark his family, from whom would spring a new generation (Semites from his son Sem, Gentiles from the others), is a type of Christ sheltering His newborn people in the ark of the Church. Next, we have Abraham and Isaac walking hand in hand up the mountain to the place of sacrifice. Abraham has a torch for the fire in one hand and a sword for the sacrifice in the other. Isaac has a bundle of fagots on his back. Again we see that they are types: Abraham, chosen by God to be the Father of the Jews out of whom would come the Messias, is a type of God the Father leading His Son to sacrifice; Isaac is a type of Christ the Son, the Victim. The fagots are a symbol of the cross. There is a line in this story of obedience, faith, and sacrifice which pierces to the heart. Isaac asks: "But where is the victim?" And Abraham replies: "God will provide the victim." For Abraham He provided a ram caught in the brambles; and for us He provided His beloved Son, born in a stable, died on a cross. Then comes Jesse in a crimson robe with a golden crown, holding an ancient musical instrument that looks like a cello. Try as we might, we can find no explanation for the cello; it simply appeared with Jesse in an old illuminated manuscript and delighted the children. Jesse is one of Our Lord's grandfathers and is familiar to us in the genealogy of Our Lady known as the tree of Jesse; she is referred to as springing from the Root of Jesse. There is another interesting thing about Jesse: his grandmother was Ruth, the lovely widow who returned to Bethlehem with her mother-in-law Noemi, although by birth she was not a Jewess. "Thy people shall be my people; thy God my God," she said. We had never stopped before to think what that meant: Our Lord had, among his antecedents, a Gentile grandmother! Next is the son of Jesse, King David. He sits holding his harp to remind us of his beautiful songs, the Psalms, and wears royal purple and a golden crown. "Jesus, son of David" . . . "Out of the house of David" . . . "Mary and Joseph of the house of David." All these point to Bethlehem, "the city of David." Indeed the very name, Bethlehem, means "house of bread," which lifts our minds to still another meditation on this "son of David." Then — Mary. She is beautiful in a blue mantle with white stars and a gold crown with stars about it. It is easy to see the point of her title "Gate of Heaven." Through her He came, and it is through her we go to Him. Eve weeps at the top. Mary rejoices at the bottom. Below Mary in swaddling bands, a snug white cap on His head, a gold cruciform nimbus behind him, is Jesus. And at the bottom in gold, as though it were shouting and singing and dancing, is GLORIA. If the children are small the figures are best painted by the grownups with the little ones held firmly at bay. They do jiggle and upset things. It will also help if the candle is lodged firmly in its box and painted there. But the planning, the talking, the awe and wonder of reading and conversation about these great things are for all the family; and as the children grow older they can help with the painting, each one doing a bit so that it is really a family affair. What if it takes all of Advent to do it? It is a beautiful preparation for Christmas. Without once saying: "Christmas isn't all presents, dear; Christmas isn't just Santa Claus," we begin to teach them what Christmas is. The feast of Our Lord's birth in the stable at Bethlehem is more than the gayest and happiest event of the winter. It celebrates the beginning of the Redemption, the story of God's love after man's disobedience, of God's desire that man shall be with Him in Heaven. It contains the seed of all the truths of the Faith, of the doctrines they must learn about the Church, the sacraments, the Mass. It explains how we must love one another, why we must love one another, why we get presents at all on His birthday. The greatest gift of all at Christmas is ours: the Son of God was sent to buy us back with love.